What an opening couple of chapters! There was no way I was going to be putting this down any time soon. I was completely intrigued by the mysterious great-uncle Fitzpatrick and his devoted library. The anticipation of every page and creeping sense of unease just draws you into this superbly written novel. With so many twists you're not sure yourself who and what to believe never mind poor Ran. Fantastic and vivid descriptions of every nook and cranny of Newton Hall have you feeling like you're wandering the dark and atmospheric rooms yourself and I could easily imagine the smell of camphor myself. Ranald McGhie, suffering from mental health problems discovers his late mother was related to one of Glasgows oldest merchant families. In a reading of his great-uncle's will he inherits Newton Hall, a vast mansion with an even bigger library which must stay intact. As he explores the Hall’s endless corridors, Ran’s grasp on reality appears to be loosening. And then he comes across an ancient unused lift; and in that lift a mirror. And in the mirror . . . the reflection of a woman. This is my first gothic style crime novel in a contemporary setting and it is without doubt charismatic, intriguing, mesmerising and darkly fascinating which has left me wanting to read more in this genre. With the book's focus firmly rooted in mental health the author has done a brilliant job interweaving this with a ghostly haunted house and a growing sense of paranoia - who wouldn't think they were slowly going insane with delusions of a long dead woman? I found this an extraordinary read with palpable anticipation on every page, never knowing where the next chapter would be taking you and forever keeping you guessing. Utterly gripping and unputdownable I highly recommend this book, it was a complete change for me and most definitely welcomed. 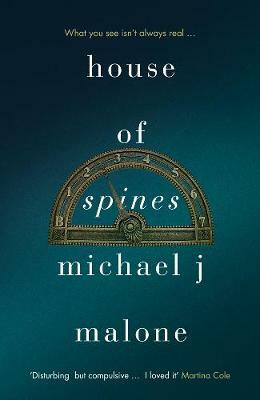 Michael J Malone is a truly gifted writer and deserves to do hugely well with ' House of Spines'. A beautiful cover depicting the old fashioned elevator dial completes the overall effect of this spooky and twisty tale. An amazing 5 stars!